There are a number of avenues to dealing with a lack of energy. The problem could be stress, or you may need detoxifying or hormonal equilibrium, or a few other complaints. When you’re feeling drained, unmotivated or exhausted, it can be a sign that your body requires a well-executed detox to regenerate the body with vibrant energy to enjoy life. It is best achieved at least once but preferably twice a year. Recharging the body’s battery is very simple when you know how. The thought of attempting a clean by yourself is often not considered. Maybe you just don’t know how to do a detox? It is important to care for the body now because you will have to live in it for the rest of your life. Since World War II there has been over 50,000 new chemicals produced! The body requires elimination of these. The body is constantly being bombarded with toxins from foods, preservatives, medications and the environment around. The Constant fumes are inhaled through breathing while frequently touching objects absorbs chemicals into the blood stream through the skin. Everybody has a little bit of stress in their lives. But when stress and anxiety starts to get extreme the body can no longer cope and symptoms develop. These symptoms often include sleep disturbances, mood swings, digestive disorders, irritability, tears, loss of passion or drive, lack of interest in activities or tasks that you once enjoyed, fatigue, overeating and increased addictions. 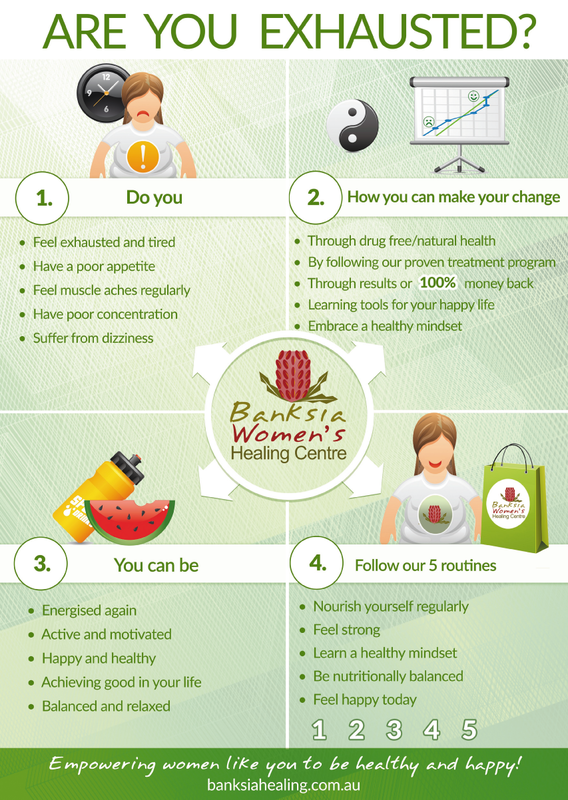 To regain Vitality, Banksia Women’s Healing Centre offers support through Traditional Chinese Medicine practices and other natural remedies to help you reduce your stress levels and manage symptoms. Discovering ways to increase energy, relieve any pain and not be so irritable with other people around you, bringing you back into a healthy Yin Yang balance again and become your happy, go lucky self again. The first step is getting to know each other. Call or email on the details below so we can make an appointment to understand your journey, where you’re at right now and where you want to go, and we’ll come up with a plan to help that happen.